Good evening! 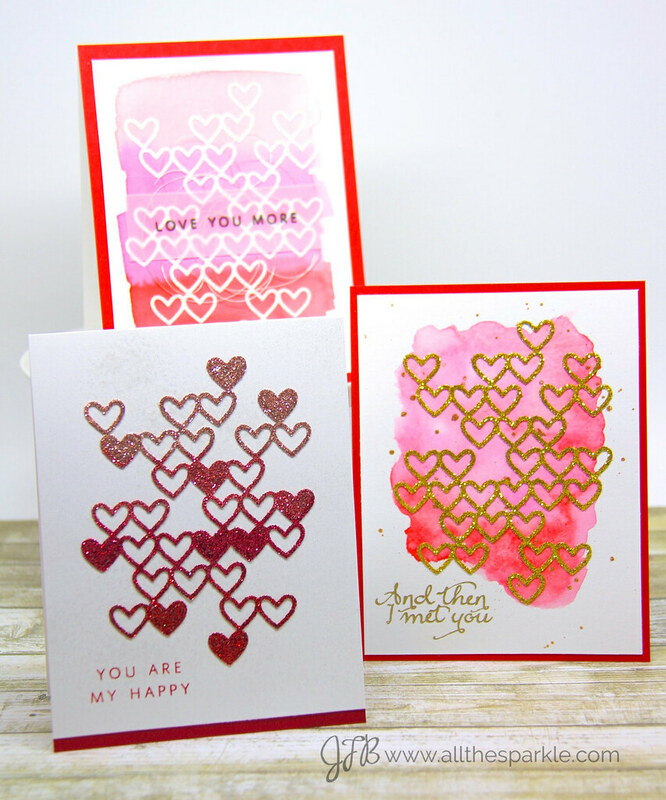 Jess here with a trio of sparkly cards for the February A Blog Named Hero Challenge! 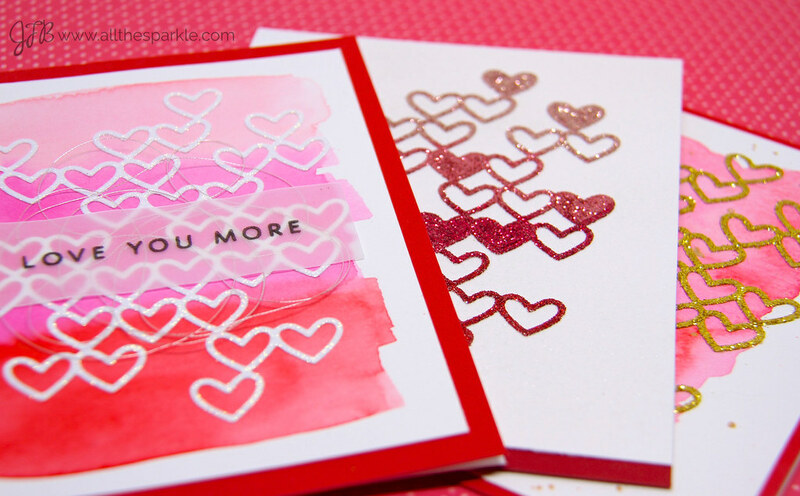 This month we’re teaming up with Simon Says Stamp and challenging you to add a little sparkle to your cards! You can click the graphic below to go straight to the challenge link! If you’re a regular reader of mine you know that I just can’t help adding sparkle to most of my creations so I was super excited for this challenge. I couldn’t limit myself to just one type of sparkle so I made three cards! For my first card I did a watercolor wash with distress inks and let it dry. While it was drying I die-cut the hearts from white cardstock and then pressed a versamark pad all over the die-cut. While it was still sticky I dipped it in holographic embossing powder and heat set the powder. I adhered the die cut to the watercolored panel and then added an embossed sentiment on vellum from a Hero Arts set over a tangle of metallic silver thread. For the second card I adhered a piece of stick-it adhesive to a piece of white cardstock. I die-cut the same hearts die and then carefully peeled off a little of the adhesive backing to reveal the top of the die. I sprinkled pale pink glitter over the top third of the die and then carefully burnished it with a bone folder. Next I peeled a little more of the backing off and sprinkled a dark pink glitter in the middle third of the die. After burnishing the dark pink glitter I peeled off the rest of the backing, sprinkled red glitter on the bottom third of the die, and then burnished the whole die. Next I spritzed shimmer spray onto a piece of white cardstock and let it dry. 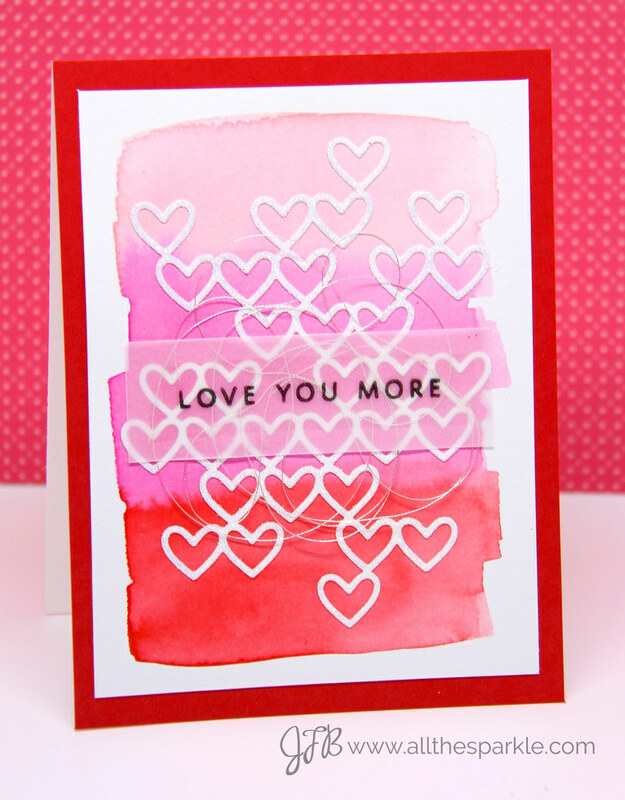 I stamped the sentiment with red ink and then adhered the die-cut to the shimmery background. 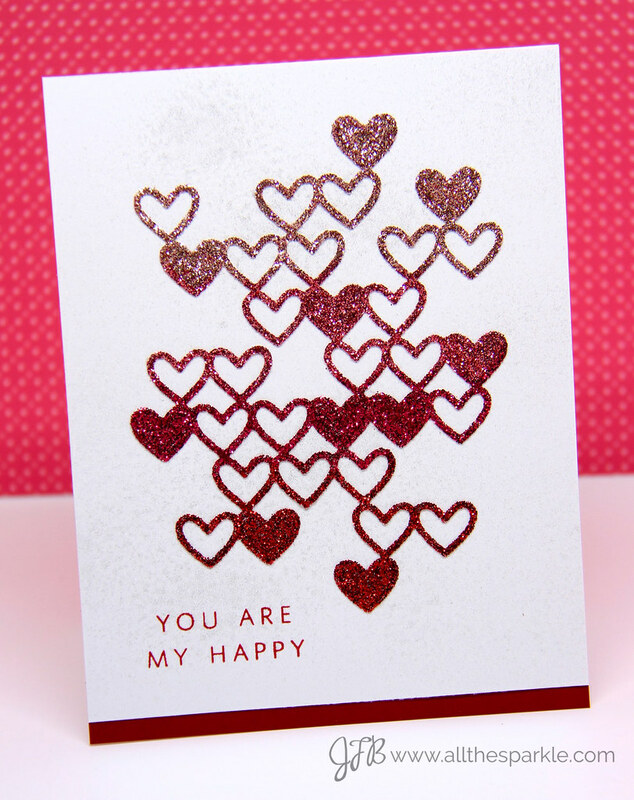 After looking at the card I decided to glitter a few of the hearts from the die-cut and glued them back inside the die. For my last card I wet a piece of watercolor paper in the same basic shape as my die-cut. Then I smooshed the same distress inks onto an acrylic block and dropped color onto the wet paper and let it spread naturally. 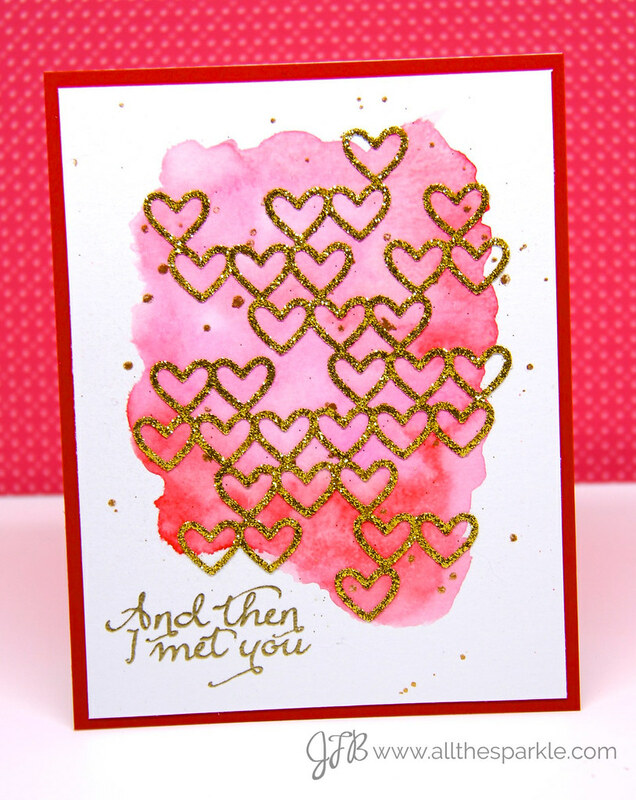 While that dried I used stick-it adhesive and cardstock to adhere gold glitter to my heart die. Once my background panel was dry I flicked on some gold shimmer spray, stamped and heat-embossed the sentiment with gold embossing powder, and adhered my glittery die-cut. So there you have it…lots of sparkle with the help of sparkly embossing powder, glitters, and shimmer sprays! I hope that gives you some ideas of how to add sparkle to your projects! Thanks so much for visiting today and enjoy the rest of your weekend! These are all gorgeous! LOVE this heart die! sweet:) i love your sparkly valentines creations:) thanks for being there! Love these glittery, gorgeous cards Jess! Very pretty set of glittery cards!! I'm all about the sparkle, so I love all three, but that ombre glitter is fab!